When I was growing up, my dad bought a lot of those compilation CDs you can find at Wal-Mart or an FYE for like $5-10. There was a lot of garbage on those CDs, but some of them had some real gems. And I discovered some of my favorite singer-songwriters of the 70s on those hodgepodges of music -- Janis Ian, Jim Croce, Harry Nilsson, Dan Fogleberg, etc. And whenever I hear, "I Need Never Get Old," by Nathaniel Ratelif & the Night Sweats, I'm immediately transported back to the best of those 70s Americana sounds that helped define my initial explorations of music. You grew up in rural Missouri and were involved in missionary work in your past. Has either experience informed your music, either on a technical level or on a more cosmic level? 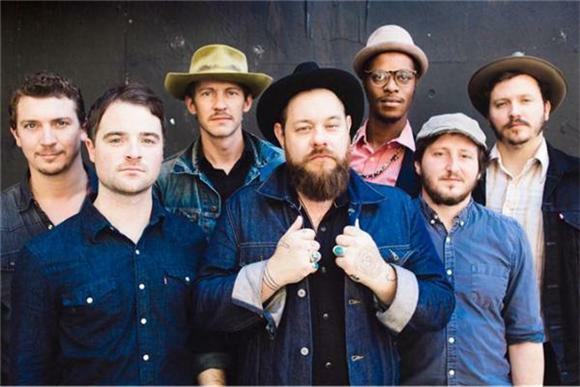 Nathaniel Rateliff: I'd say all of my experiences influence me in some way or another. I don't do too much thinking about how each event influences me specifically. Tell me about the Night Sweats. Did your band form organically or was it a process before the sound was represented as youd imagined? I started writing music for the Nightsweats in downtime between my solo work as a different creative outlet. The songs were influenced by old soul and R&B recordings, so I knew that they were going to need a full band. I started enlisting friends of mine to play, and the sound just came together that way. A theme that runs throughout your music is desperation and hope. Has your relationship to these two emotions evolved as you continue to incorporate that theme into your music? I have a palette of emotions that I'm always drawing on when I write and it changes and matures in the same ways that those emotions exist in my life.